A press copy of Minotaur’s Betrayal was provided for the purposes of this review. I was generally disappointed with the first adventure in P.B. Publishing’s Minotaur Trilogy. It was a short, single mini-dungeon that didn’t do much with the intriguing minotaur premise. The next adventure in the Minotaur Trilogy, “Minotaur’s Betrayal,” does a better job utilizing the honorable warrior race while also offering a huge dungeon complex as you and your minotaur buddies take the fight directly to a massive orc stronghold. “Minotaur’s Betrayal” is a combat-heavy adventure featuring a mega-dungeon full of orcs, designed for a party of 6th level for 3-5 hours. That estimated play time is completely bananas, as the dungeon crawl alone would take my group at least two or three multi-hour sessions to get through. NOTE: This adventure makes extensive use of Volo’s Guide to Monsters in regards to Orc statblocks and information. 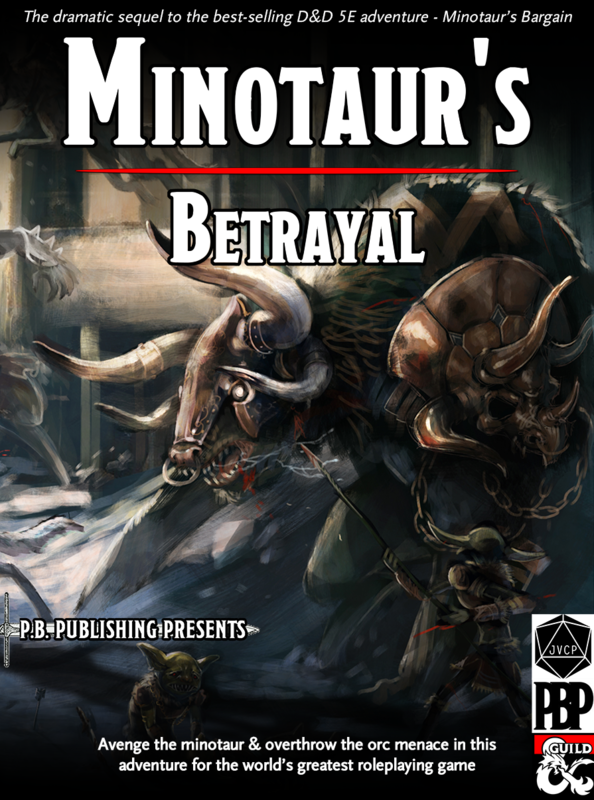 As part two of a trilogy, “Minotaur’s Betrayal” picks up after you’ve earned the minotaurs’ trust in the first adventure, “Minotaur’s Bargain.” You don’t need to play that adventure at all, however, and there are notes for skipping a few sections in the beginning in Chapter 1. If you do run “Minotaur’s Bargain” first it would help flush out the Minotaur race, and give the later death of their leader and titular betrayal a lot more meaning – though as I mentioned in my review that first adventure is very light on role-playing. As a reward for making it through the arena in “Minotaur’s Bargain,” your party is given six Minotaur Veterans. These are slightly beefier CR 4 minotaurs, including one named Minotaur Veteran called Perseus with max HP. Your goal is to return to the town that sent you, in order to help stage a defense against a large orc raiding party, as detailed in Chapter 2. While travelling there are two scripted encounters where orc forces harry the party, specifically trying to kill Perseus and the minotaurs, first mounted on Aurochs during the day, then on Giant Bats during a stealthy ambush at night. This helps drive home the orcs as a powerful, relentless foe and nicely foreshadows later events. The orcs are the primary threat throughout the adventure, and while the story does some cool things with them, it also somewhat limits the focus of the Minotaurs, save for a single scenario about halfway through. 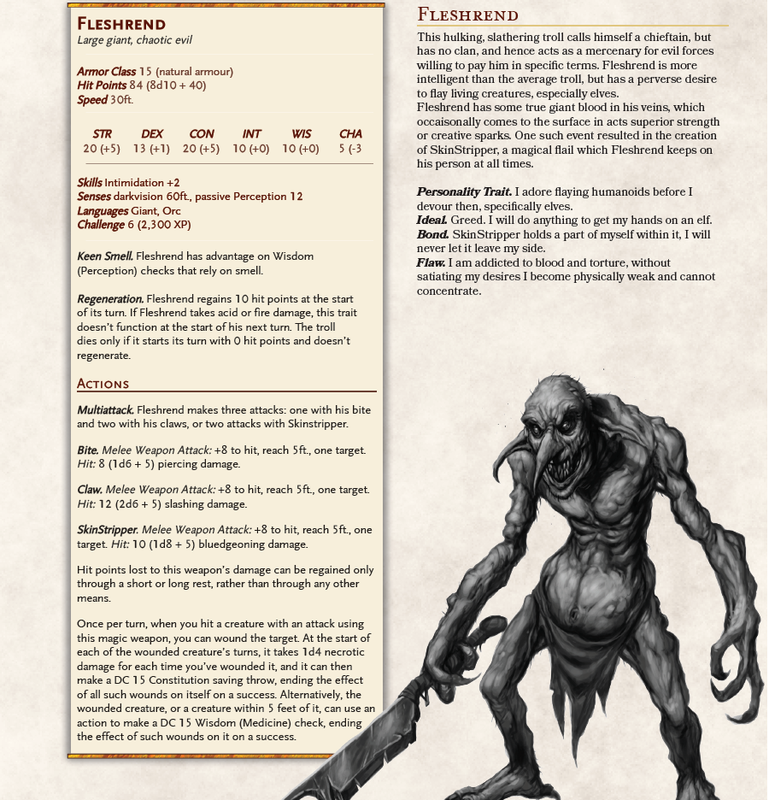 The orc attack on the town is actually a diversion, as they show up with only about a dozen forces lead by a sadistic, custom-built Troll NPC named Fleshrend (CR 6). It’s here you can start if you just want to jump in with this adventure first. This is a big combat encounter including the PCs, Minotaur allies, town militia, and orc invaders. As a DM this would absolutely overwhelm me and my party, but thankfully it’s designed to end in Round 4, when the attackers see the signal (smoke in the distance) and retreat. The party can alter the climactic encounter at the end of the adventure if they manage to defeat Fleshrend or any of the forces here, however. The smoke is coming from the Minotaur campsite. Turns out the attack on the town was to distract the PCs and Perseus’ crew. A Minotaur traitor named Theron staged a coup by allying with the nearby orcs. He stole an orcish relic – the Banner of Grummsh, guarded by the Minotaurs, and in exchange they helped him storm the camp and murder the Minotaur leader, Astarte. Now we’re talking! I love this surprise attack that pulls the rug out from our heroes. The Minotaurs race back to their camp and the PCs should follow (incurring 2 levels of exhaustion – ouch!). The PCs and Minotaurs can either directly confront Theron and his cronies or sneak inside to gather information. Story-wise this is by far the most interesting section of the adventure, but it’s also shockingly the most limited, spelled out in only two pages. There’s a solid description of the tortured and slain Astarte (I would totally leave her clinging to life to deliver some awesome final death lines) but limited notes on how to role-play Theron, and nothing on how to treat a non-combat or non-stealth approach. The PCs need to learn that Theron paid the orcs with the Banner of Grummsh, a powerful custom-built Wondrous Item that ties into orcish lore in some neat ways (wait I thought this trilogy was all about Minotaurs?). The Banner was hidden away by Astarte and handed over to the orcs. The Minotaurs demand vengeance on the orcs and task the PCs with retrieving the Banner from the nearby stronghold in Varg-Kala, the mega-dungeon complex that takes up all of Chapter 3 and a solid two-thirds of the adventure. Varg-Kala is awesome. It’s a sprawling network of connected caves, with a central chamber that’s over 200 feet across, and an underground (er, more underground) sewer system – 14 total areas. There are three optional side entrances you can employ if your characters carefully search (or if you just want them to enter a certain way) as well as a proper main entrance guarded by a ruined tower. Varg-Kala feels like an actual living dungeon, with most orcs living their daily lives around their huts, shrines, fighting pit, pig pen, rookery, and nursery. There are several fun events the PCs can stumble into, including a Gollum-like figure living in the sewers, several potential allies-as-prisoners, and the final confrontation with the orc War Chief – and possibly Fleshrend if he survived the battle in Chapter 2. There are mountains of tasty loot to be found that would be the envy of any dragon hoard, while the prisoners let the PCs feel like heroes instead of bloodthirsty treasure-hunters (not that there’s anything wrong with that!). By the end the PCs (and minotaur allies) should have crushed the orcs, retrieved the Banner of Grummsh and put Perseus in charge of what’s left of the minotaur camp. “Minotaur’s Betrayal” is a solid adventure that includes a little bit of everything. I love a meaty dungeon crawl, though much of the minotaur flavoring will come from your interactions with the PCs via Perseus. Keeping he and his horned buddies alive in the dungeon could prove quite challenging but hopefully remain an enjoyable side objective. Part three of The Minotaur Trilogy (coming early next year) teases that both warrior races will have to come together to fight a new Abyssal threat that’s unleashed from the Banner’s usage, which sounds like an appropriately epic climax to the series. I’m looking forward to it! 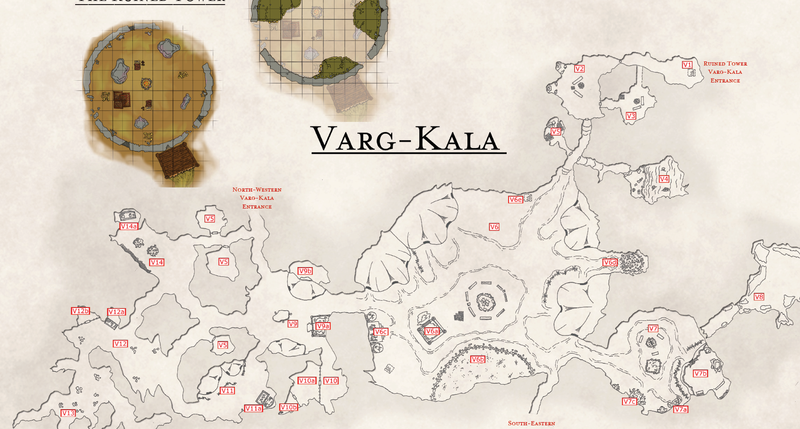 Varg-Kala is a huge, impressive dungeon with multiple entrances, neat NPC interactions, and tons of encounters and treasures. Uses all the orc information in Volo’s Guide to Monsters to create a fully believable orc society. Minotaur ally NPCs are a great addition, and notes for using them in the final dungeon are solid (they don’t exactly like stealth, for example). Notes for adjusting every single encounter for 5th, 7th, and 8th level parties. Though there’s some neat story moments with the titular betrayal, the adventure does far more with exploring orc culture and society than the actual minotaurs. Perseus can (and should) be a major NPC ally to the party, but he’s barely given any notes on role-playing or personality. The most story-intensive scene of the adventure (confronting Theron) is given the least amount of attention. Only the small Ruined Tower map is given color, and there’s no map at all for the town siege. The Verdict: With significant story beats culminating in a massive dungeon crawl, Minotaur’s Betrayal is a much improved sequel by enlisting an exciting orcs versus Minotaurs theme. Big comic events, the kind which Marvel pulls out once or twice a year, have what are called tie-ins, or companion comics. These are side stories that take place during the big event, usually focusing on minor characters and subplots within the larger event framework. This week’s episode of The Walking Dead is their tie-in episode, focusing on several smaller side stories while the Savior base of Sanctuary is still under lockdown from our group’s initial attack. The heist turns into an epic clash of dragons as we take on the pair of blue dragons who are not happy about their stolen hoard. I ran outside of the beached ship, and chaos raged around me. A loud snap followed by a monstrous roar raged in the air nearby, as I saw one of the dragons plummet to the ground, wrapped in a large net. Just in the distance I could see Halfred floating in the air, holding a crossbow as big as his body. “You think to evade me?” a mocking voice boomed to the south, signaling the other dragon’s pursuit. Who was he after? I only now realized that our party-wide invisibility prevented us from actually seeing other in a moment of crisis. The dragons had no such problems. The southern dragon unleashed a blast of lighting inside a circle of pure blackness that had sprung up around the dock. Bryseis? Hopefully she survived. The other dragon ripped out of its netting, called for his brother, deftly leapt behind Felgolos and unleashed a white-hot shot of lighting from his mouth. Our bronze dragon ally shrugged it off but smoke rose from poor T.I.M.’s blackened, charred body. He remained standing, miraculously. I turned just in time to see the the southern dragon leap off the nearby ruined building and hurtle straight for us. Hello GCC fans! Due to Thanksgiving holiday here in the US this week (specifically, our DM traveling out of state), we’re moving our weekly D&D session to this Saturday, November 25. Same start time. See you then! It was bound to happen. After four solid weeks of exciting war-torn battles across multiple fronts that all took place within the same day (maybe even the same hour), we finally had to return to Sanctuary to check on the Saviors. We opened with a flashback – that Savior meeting Negan had claimed to be a part of when our heroes attacked in the first episode. All the Savior leaders are there, including Simon, Eugene, Dwight, and Gregory.